Right off, I didn't write Tuesday night because pit crew's friend was in town & we went to Piece for pizza and beer, and then to Phyllis's Musical Inn for, er, Bushmills. 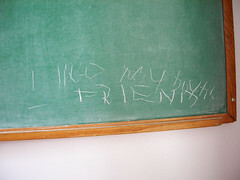 And then ended the evening with writing I like my boyFRIEND on the chalkboard with my toes holding the chalk. Tomorrow's entry, just so you know, is going to start "I didn't skate Monday night." Because MOD skate was moved to 9:00-11:00 PM, nobody wanted to go that late. More about that tomorrow.